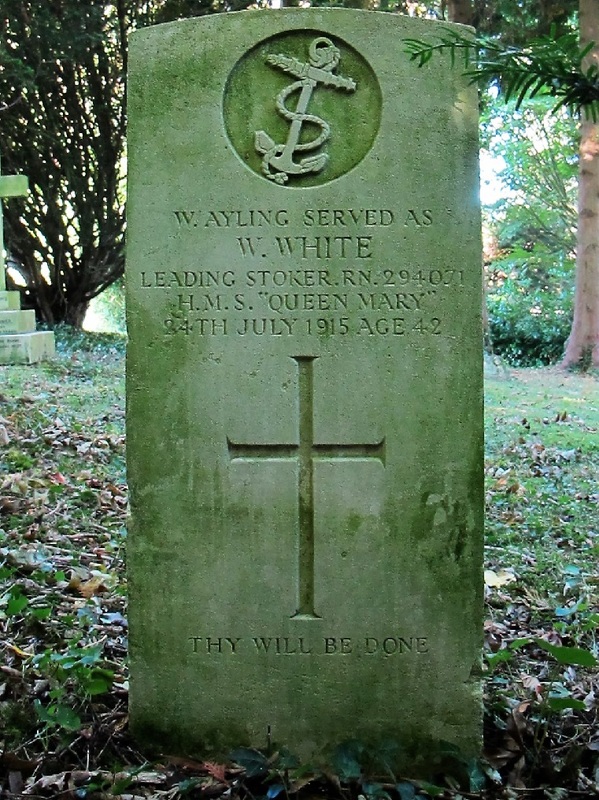 William Ayling was living with his family in Lodsworth when, well before World War 1, he enlisted in the Royal Navy. We have not yet discovered why he enlisted under the alias ‘William White’. He died suddenly from illness whilst on leave. 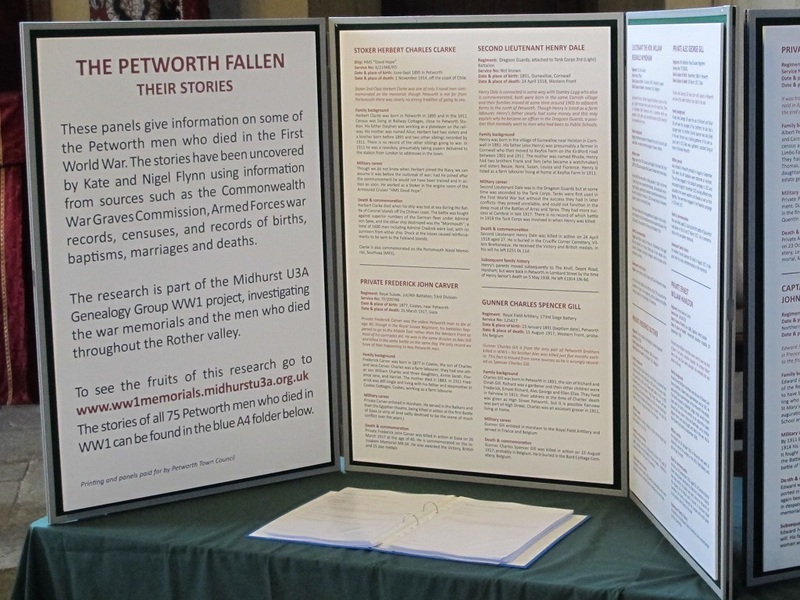 Possibly for that reason, he was not commemorated on the Lodsworth war memorial, although he was buried in the Lodsworth churchyard with a Commonwealth War Graves Commission gravestone. 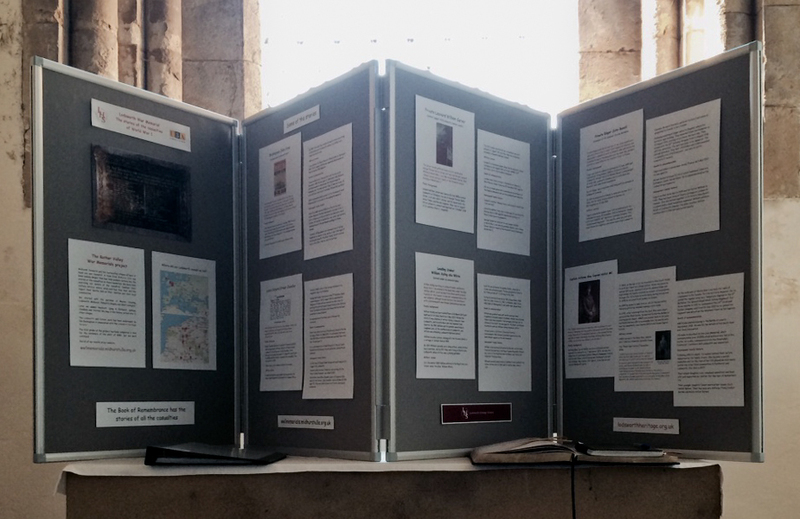 William Ayling was born in Graffham on 31 March 1873 and baptised at St Giles church Graffham on 4 May 1873. 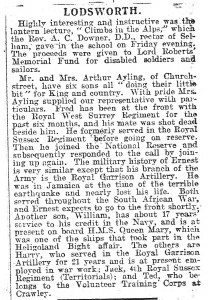 He was the third of nine children of Arthur Ayling, a labourer from Lodsworth, and his wife Mary Ann née Newman from Duncton. By 1881 William and his parents were living in Langham Lane, at the southern end of Lodsworth, and William was attending Lodsworth National School. William became a groom, lodging with the Stevens family in a cottage at Selham Farm in 1891. However, when he enlisted his occupation was recorded as ‘labourer’. 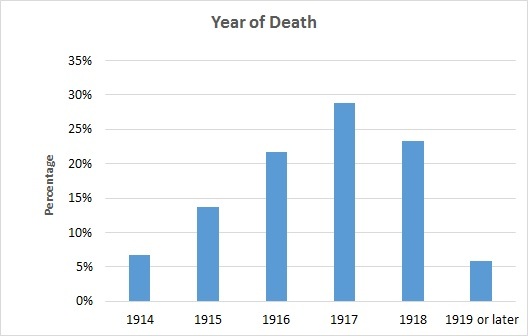 By 1891 William’s parents were living in River, where Arthur was a postman, and by 1911 they were living in Church Lane, Lodsworth, where Arthur was a jobbing gardener. 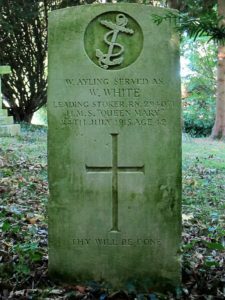 On 1 December 1899 William enlisted in the Royal Navy as a Stoker under the alias ‘William White’ and with his date of birth recorded as 31 March 1874. We don’t know why he gave his name as White or why his year of birth was wrongly recorded. Later he was promoted to Leading Stoker, demoted to Stoker and promoted again to Leading Stoker. This was presumably linked to the fact that he spent three periods of 7 to 10 days in the cells! During his service he served on the following ships: HMS Camperdown, HMS Warrior, HMS Victory II, HMS Formidable, HMS Hecla, HMS Duke of Wellington II and lastly HMS Queen Mary. William was granted a few days leave and, on the journey home, stopped at a friend’s house in Peckham, London. 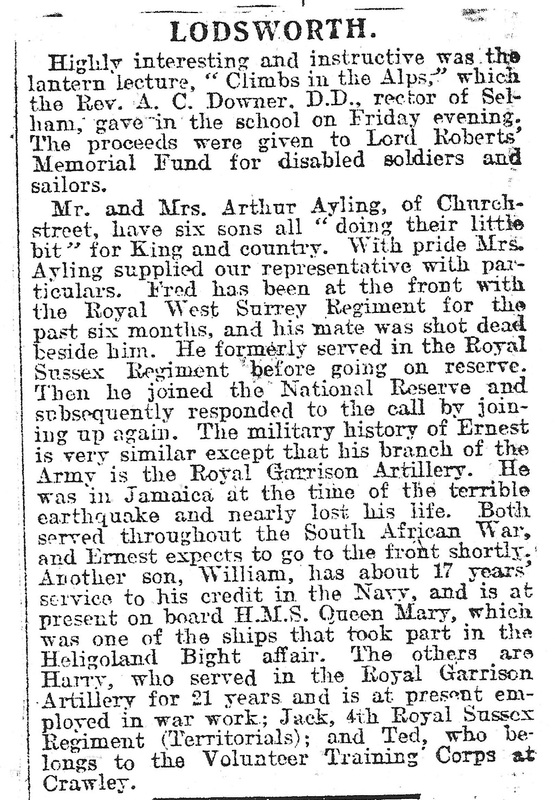 Whilst there on 24 July 1915, he was taken ill and died suddenly ‘from syncope [fainting] due to dilation of the heart’. He was aged 42. His death certificate records his name as ‘William Ayling otherwise White’. He was buried in St Peter’s Churchyard, Lodsworth on 30 July 1915 with a Commonwealth War Graves Commission gravestone. His name doesn’t appear on the Lodsworth war memorial. 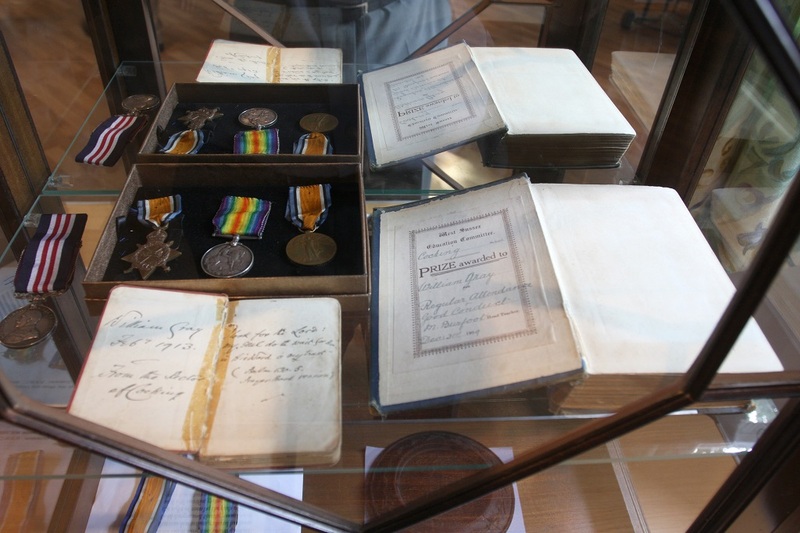 William’s five brothers all served in the war but survived. 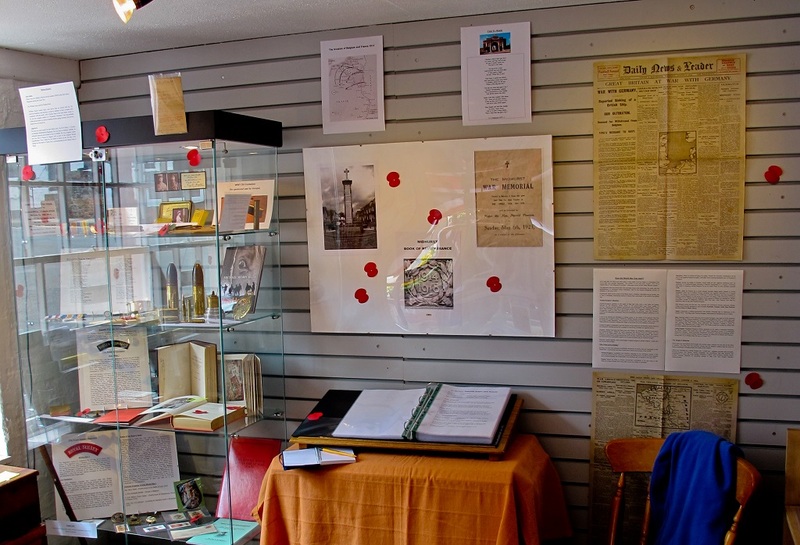 Fred and Jack served in the Royal Sussex Regiment, Ernest and Harry in the Royal Garrison Artillery, and Ted in the Volunteer Training Corps. William’s parents later lived at Shotters Farm, Lickfold. His father Arthur died in 1921 and his mother Mary Ann in 1929.